Every year I visit Las Vegas, a new tiny off-the-strip Japanese restaurant opens in the same nondescript Chinatown mall. First was Raku – robatayaki (grilled skewers) and classic Japanese cuisine, then came Monta – classic ramen (noodles) and now, Kabuto – omakase (Japanese for “I’ll leave it to you”) which basically means it’s a surprise meal created by the chef right then and there. 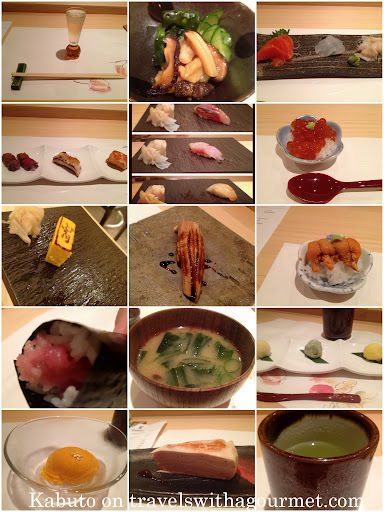 It’s a Japanese culinary adventure and one that I highly recommend to lovers of Japanese food. Kabuto is small with just ten seats at the bar, two tables of four and only two set menus to choose from: the $48 nigiri menu (10 pieces of sushi) or the $80 omakase menu (sashimi, miso soup, six pieces of nigiri and a grilled item). It is Japanese minimalism at its’ best. Interiors are blond wood with the only color coming from the numerous chunks of fresh fish displayed in a glass-topped box ready to be sliced and served. There is no sushi refrigerator case on top of the bar to destroy the aesthetic and further proof that this meal is all about fresh fish, straight from the box, placed on top of warm vinegared rice and set in front of you like a piece of jewelry meant to be admired for a second then eaten immediately. The three of us (my brother-in-law C, my ten-year old son J and myself) settled into our highly-coveted bar seats and chose – omakase for C & I and the nigiri for J, his first all-sushi surprise meal. All they asked was if we were allergic to anything and just like that one of the best meals I have ever eaten began . First up was a tiny shot glass of cold mango-flavored sake served with a tiny salad of sliced cucumbers, seaweed, shiitake mushrooms and clams. This was followed by the sashimi course, two types of expertly-sliced fresh fish and slice giant clams with a tiny bit of fresh wasabi and some of their aged artisan shoyu on the side. Next came the grilled course: vegetables wrapped in a thin-slice of beef tataki (raw beef seared on the edges), miso-topped white fish and salmon. Assorted nigiri came next, individually prepared and set on a granite plate one by one: masaba (Japanese mackerel), katsuo (bonito) and suzuki (sea bass). Then came a tiny portion of rice topped with ikura (salmon roe), a freshly-made warm rectangle of branded tamago (a Japanese puffy omelet traditionally served plain or over rice) and a freshly-grilled anago (sea eel). Before our next course of a hand-roll was served, we were asked by the chef if we wanted some more nigiri a la carte. How could we refuse? We each had the uni (sea urchin), freshly-flown in from Hokkaido and coming in a lined wooden box like chocolate truffles – four petals of orange sea urchin over a dollop of rice and a tiny dot of wasabi – heaven! We also each had the suzuki (sea bass), the kamashita toro (fatty tuna), the harasu (trout belly) and my favorite, the o-toro (premium fatty tuna). (No guilt as it was all good cholesterol) The hand-roll came next – chu-toro (medium fatty tuna) rolled with rice in a crisp square of nori (dried paper-thin seaweed) just like a cigar and not in the usual cone-shape. Fresh miso soup was offered next, either with fish bones or with tofu and seaweed and finally dessert: house-made mango sorbet topped with gold leaf for me, the multi-layered strawberry crepe cake for J and the mochi trio for C along with some piping hot green tea and it was all over. It was one of those dinners that leaves one both sated and craving for more, the way gastronomic meals are meant to be. 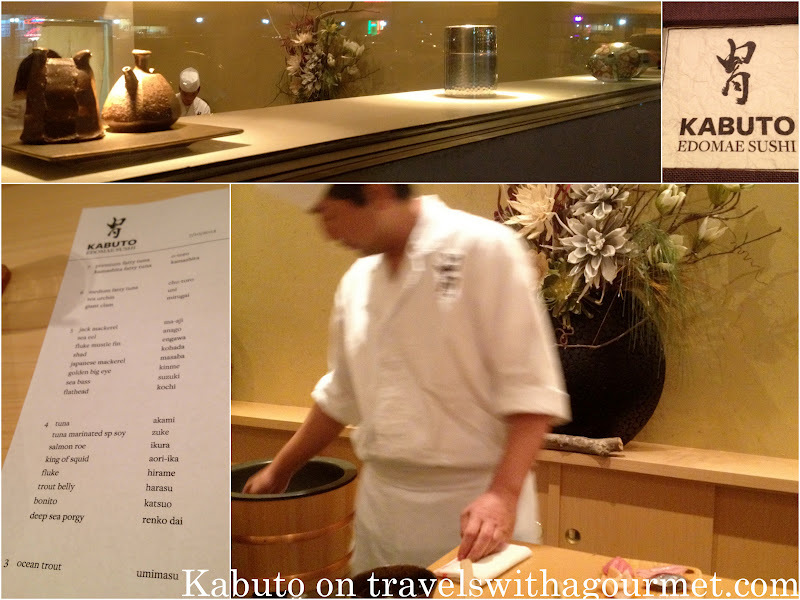 Kabuto definitely goes straight onto my list of Las Vegas musts. *Open Mondays to Saturdays for dinner from 6:00 to 10:00 p.m.